Adams, Robert. 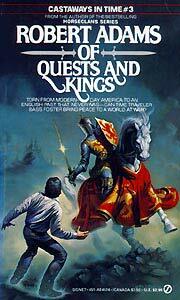 Of Quests and Kings . NAL/Signet 1986. What if: Nestorians won at the Council of Ephesus, 451. Series note: Series containing in order Castaways in Time , The Seven Magical Jewels of Ireland , Of Quests and Kings , Of Chiefs and Champions , Of Myths and Monsters , and Of Beginnings and Endings . Summary: Tourists trapped in a remote villa are transported to a 17th-century in which the Moorish pope has declared a Crusade against England. Series note: First volume in the Castaways in Time series. Published: Donning 1979 (0915442965); NAL/Signet 1982 (0451114744), 1985 (0451126645BUY). Summary: The battlefield between Pope Abdul and Arthur III Tudor shifts to the high seas and to Ireland. Series note: Second volume in the Castaways in Time series. Summary: Abdul II may be dead, but the fight in Ireland continues. Series note: Third volume in the Castaways in Time series. Summary: More intrigue in Ireland and England, and new fighting in North America. Series note: Fourth volume in the Castaways in Time series. Series note: Fifth volume in the Castaways in Time series. Series note: Sixth volume in the Castaways in Time series.